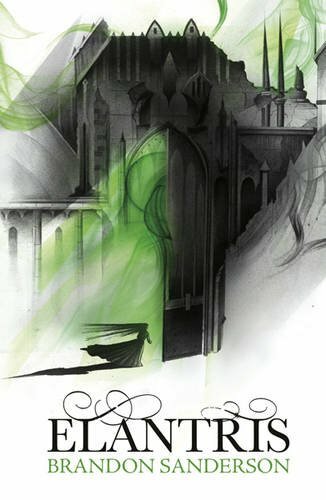 I first read Elantris by Brandon Sanderson back in 2012, and I’ll direct you to that link for a synopsis and/or my original review. It’s been nearly six years, and it was time to revisit the story and this world. Normally, I don’t write re-reviews, but I like this “callback” category when I have new thoughts and ideas about a book. Let me start by saying that when I first read this book, I was relatively inexperienced in full-on fantasy as a genre. I’d only started reading Sanderson in March 2012, and Elantris was my seventh experience with the author in four months. I’d read a few other fantasy authors – most notably, Diana Wynne Jones – but I still had a lot of trouble with wrapping my head around new names, places, worlds, magic systems, creatures, etc. I felt the same about Elantris, though in the end, I declared the book a favorite of the year. Now, it’s been six years. Despite this book initially being a favorite, it trickled from my mind very quickly. Certain parts of it remained memorable, as well as the general plot idea, but most disappeared completely. Hence the need for a reread. I chose to revisit the book on audio, read by Jack Garrett, a new-to-me narrator. For the record, he did a pretty good job. He sounded a bit too like a commercial announcer in places for my tastes, but mostly I enjoyed the production. I enjoyed the book even more, right from the very first minutes of listening. The story begins immediately. One of the many storylines that entwine here is that of Prince Raoden, who wakes up to find himself taken by a local curse. He’s thrown into the city of Elantris, considered now to be a walking corpse. The king tells everyone that the prince has died rather than admit the shame of his son succumbing to the curse. When I say the story begins immediately, I mean that Prince Raoden wakes up cursed and finds himself bustled into Elantris by the middle of page two. Here’s the funny thing about that. My thoughts when I began the audiobook: “Wow, that starts fast. That’s probably the fastest I’ve ever seen Sanderson start a book.” Going back to revisit my original review: “The book was slow to start…After a hundred pages or so, though, it all came together and I found myself racing through it.” Ha! That’s the difference six years of reading fantasy makes. There is a lot packed into these 600+ pages. Sanderson explores politics, religion vs faith, the effects of greed and hatred on a person’s soul, the struggles of women to be who they really are in a culture that expects them to be demure and frivolous, and the importance of study. One of the biggest themes is on the way our lives are changed by having a purpose. The cursed Elantrians feel constant pain. Always hungry, every tiny cut or bruise acute because they never heal, not to mention the psychological trauma of being tossed into a prison city and separated from everyone and everything they loved. Some turn to violence, others to madness, others to despair. Raoden, however, has spent his life trying to figure out how to make the world a better place for his people, and he simply shifts focus. The Elantrians are now his people, and he attempts to drag them from a place of misery to one of purpose. Even if that purpose is simply to make shoes so that no one walks barefoot, or to plant seed corn so that there will be food to eat in a few months, the simple act of having a purpose helps to ease pain both physical and psychological. I love that so much. So yes, I fell in love with this book all over again. Hopefully now, less of it will trickle away from me over time. And hopefully one day, Sanderson will return to this world and write more, as there is so much still left here to explore. This entry was posted in 2018, Adult, Prose and tagged audio, callback, divinity, favorite, reread, speculative. Bookmark the permalink.